Although many investors like to follow equities for potential stock price increases, a large number also choose to focus on income stocks. Some stocks offer cash payouts compelling enough to make dividend stocks the stocks to buy. This is especially true for investors focused on cash flow or retirees who depend on their assets to generate income. The average S&P 500 stock dividend yield currently stands at just over 1.9%. While that may not impress many investors, that still beats yields one can find at many banks. Also, it allows for the long-term appreciation gained by investing in S&P 500 equities. Income-focused investors tend to look at two classes of dividend stocks. Some income stocks have earned the designation of “dividend aristocrat.” These equities have increased dividend payouts for a minimum of 25 consecutive years. While no stock has to pay a dividend, relinquishing dividend aristocrat status will usually lead to the mass selling of a stock. Hence, dividend stocks which can avoid such an outcome will almost always continue paying and increasing dividends. Real estate investment trusts (REITs) have also become popular income stocks. These equities stand out for their investments in both real property or the mortgage securities related to real estate investing. They also have become popular because REITs have to pay out 90% of their net income to receive an exemption from federal income tax on their operational income. REITs also pay a higher average dividend. This average payout of 4.36% stands at more than double the yield seen from the average S&P 500 equity. AbbVie (NYSE:ABBV) spun off from Abbott Laboratories (NYSE:ABT) in 2013. Best known for the drug Humira, ABBV continues to develop and introduce new drugs as its best sellers begin to lose patent protection. The stock has lost more than one-third of its value since January. However, this places ABBV stock in a fortuitous position for both income and value investors. Due to the lower stock price, the price-to-earnings P/E ratio has fallen to just 10.2. Moreover, analysts also expect profits to grow by 40.7% this year and at an average annual rate of 15.4% per year for the next five years. ABBV’s status among income stocks remains secure. This year, investors will earn $3.84 per share. This translates to a yield of almost 4.8%. Also, due to its past connection with Abbott, it stands as a dividend aristocrat. As such, these profit increases will likely translate into higher dividends. Hence, even if the stock has not yet finished dropping, investors will earn increasing amounts of cash flow while they wait for a recovery. In most cases, I recommend not buying into stocks near 52-week lows. But with an almost-single-digit PE ratio, double-digit profit growth, and a large, growing dividend, long-term investors should earn both income and gains by buying into ABBV stock. AT&T (NYSE:T) has struggled in recent years as investors have cut the cord on its traditional landline and cable TV businesses. Moreover, its wireless segment also suffered as intense competition weighed on profit margins. To stay in that business, T has also had to spend tens of billions of dollars to build a 5G wireless network. However, that 5G network will now begin to generate revenue. With it offering a minimum of ten times the speed of 4G wireless networks, most tech analysts expect it to spawn new applications not yet imagined. Its years of struggle have also positioned T stock well for new buyers. AT&T stock now trades at a PE ratio of 8.7. This comes in well below its five-year average P/E of just under 18. Also, its predicted average annual growth rate stands at 5.9% per year for the next five years. But what T stock lacks in growth, it will make up for in dividends. The company will pay $2 per share in dividends this year. That takes AT&T to a dividend yield of about 6.5%! Moreover, the stock will probably not want to give up its dividend aristocrat status. Hence, investors will likely see another dividend increase for next year. This high dividend, an unusually low P/E ratio and its 5G network make T stock an excellent investment for long-term growth and income. Ladder Capital (NYSE:LADR) functions as a REIT. While LADR owns commercial real estate, it also provides loans, owns mortgage-backed securities, and holds other investments. The New York-based real estate company was founded in 2008. It began trading as a REIT in 2014. Today, it holds over $6 billion in assets. Like most income stocks in this category, growth remains slow for the most part. The stock trades near the levels of its 2014 IPO. However, it has rebounded by over 60% from its 2016 lows. Analysts forecast 18.8% growth for the current year. For the next five years, they foresee an average annual growth rate of 5%. Still, what it lacks in growth, it makes up for in valuation, stability, and dividend payments. It currently supports a P/E ratio of about 9.1, well below its five-year average P/E of 16.2. Also, despite its short history, LADR has provided stability and income by paying a consistent and steadily-growing dividend. In some years, it has paid a substantially larger dividend to meet the 90% minimum payout requirement. This year, it expects to pay dividends of $1.30 per share. This takes the dividend yield to almost 7.8%. Given this high dividend and its below-average multiple, its stable asset base should provide investors with a generous, steady return. Omega Healthcare (NYSE:OHI) finds itself in a fortuitous position among income stocks. With baby boomers aging into Medicare at a rate of 10,000 per day, nearly all healthcare-related assets appear positioned for growth. This includes the long-term healthcare facilities owned by Omega. Since its founding in 1992, the REIT has acquired over 900 facilities valued at about $9 billion. Omega trades at a P/E of almost 21, so it does not come as cheap as some income-producing stocks. 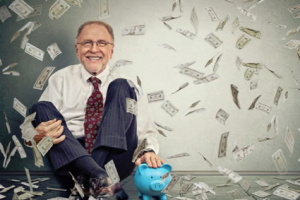 However, with the demand coming from retiring baby boomers, analysts expect income to grow at an average annual rate of 15.8% over the next five years. It also represents a vast improvement over the 0.6% yearly growth rate it saw in the previous five years. Still, the company’s business model has allowed for a slow, steady stream of profits. This has permitted OHI stock to hike its dividend over the years. In 2018, the company paid $2.64 per share in dividends, a yield of about 8%. This comes after the stock rose 33% from its April lows. Given the prospects for profit increases, both the dividend and OHI stock should see steady increases as long as baby boomers continue to become eligible for Medicare. Like Omega, Sabra (NASDAQ:SBRA) operates as a healthcare REIT. It owns almost 500 facilities in the U.S. and Canada. More than 70% of its properties operate as skilled nursing facilities. However, specialty hospitals and senior housing also make up a large percentage of its portfolio. All have enjoyed rising demand as more baby boomers age into Medicare. Analysts predict growth will average at about 6% per year over the next five years. While it may not grow as fast as some healthcare REITs, it also has not reached a high multiple. It maintains a P/E ratio of just over 11, even though SBRA stock has also risen 27% from its lows in the spring. Sabra has also maintained a steadily growing dividend since 2013. The equity should see a payout of $1.80 per share this year. At current prices, this gives new investors a yield of almost 8.4%, making it one of the better cash-producing income stocks available. Given its growing customer base and the profit increases that will come with it, I expect the dividend to keep rising for the foreseeable future. Couple that growing dividend with the low P/E ratio, and investors should find themselves well-positioned to profit from both the dividend and a higher SBRA stock price for some time to come.